Corsair | Open Systems Computing Corp.
A Reliable USB Flash Drive? I was beginning to think the phrase “reliable USB Flash Drive” was an oxymoron. I am notoriously hard on my flash drives. They always reside in my pocket, getting bent, twisted, squashed, etc. I was going through flash drives like my dog goes through squeak toys. Getting tired of shipping drives back for replacement, I thought that there surely must be a company out there that makes more rugged flash drives. Well I was right. 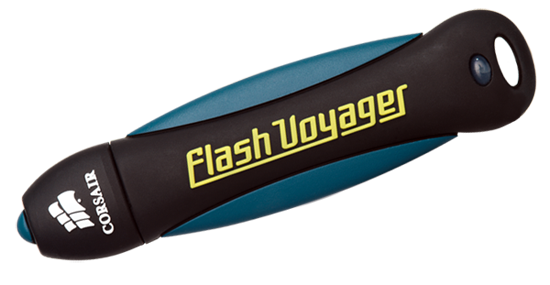 I found a company called Corsair that makes a product Called the Flash Voyager. Music to my ears. But does the product live up to the marketing-speak? Well, after 8 months of living in my pockets, I can absolutely say YES. Current capacities for this product go as high as 64GB , but the best value seems to be the 32GB model, which can be found at newegg.com for $110. More information on Corsair products can be found HERE.